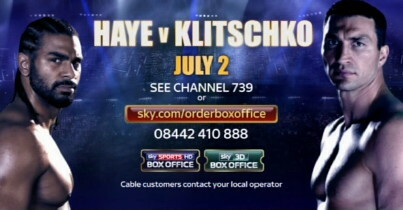 By William Mackay: IBF/WBO heavyweight champion Wladimir Klitschko (55-3, 49 KO’s) sees his July 2nd opponent WBA heavyweight champion David Haye (25-1, 23 KO’s) as being all flurry and pretense rather than someone that is legitimately a good fighter. Wladimir believes that Haye will fold when he’s met with resistance in the form of a hard punch. Wladimir wants to punish Haye for 12 long rounds before knocking him out in the 12th, but Wladimir questions whether Haye will be able to take punishment that long without being knocked out. You have to give Haye some credit. He’s a master at talking up a fight. The problem for Haye is he has a way of talking about his psychological games and dissecting them with the media. Normally fighters don’t do this because it kind of defeats the purpose of trying to scare your opponent in the first place. Haye seems to want be the type that wants to be involved with getting praise for his mind games instead of sitting back and playing it out like theater. Wladimir is sitting back hearing Haye talk about everything that he’s doing, such as refusing to shake his hand and talking trash and it obviously has Wladimir realizing that Haye is into playing games. Haye needs to stay in character and stop leaking info to the press about his mind games.